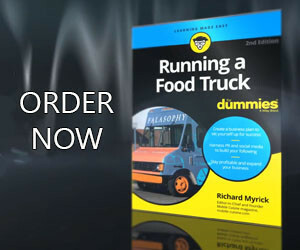 If you own an iPhone, then you’re never without a camera to snap a photo of a food truck or mouth watering food truck cuisine that catches your eye. And if you have an iPhone 3GS or newer you can record digital video to document a food truck event. Here are 5 food truck photography tips to help you take better iPhone photos and videos with your Apple smartphone. Lock your elbows close to your body. Hold the iPhone with both hands about 12 inches from your face. I usually twist my hips slightly, bend my knees a little and put my weight slightly on my back leg. Making sure the camera doesn’t jiggle is key to a good photo. Take the photo with your thumb; don’t stab at it with your finger. It is also recommend getting a bumper case for your phone to help you get a firm grip. A base iPhone with no cover can be slippery. Your iPhone can capture detailed food truck photography, but how well the photo is composed is up to you. One common photo-composition trick is called the Rule of Thirds. With the Rule of Thirds, you imagine lines that divide your photo into thirds both horizontally and vertically. The four “power points” are at the intersections of the lines. Put the subject in your scene at or near a power point of the photo. If you want to take something close up actually walk up to it, get close and click. The iPhone loses image quality even with a small amount of zooming and can become grainy and pixelated. In camcorder mode, you won’t automatically “see” the full version of what’s actually being recorded, which means you could be including things in the frame that you don’t want on tape. In order to make sure what you see is what’s being recorded, you need to double tap the screen (whether the iPhone is recording or not) to get the proper widescreen view to see more of the image. With over 3,000 iPhone photography apps to choose from, you might ask which ones are vital. The following two iPhone apps are both useful and easy to use and can help you get just the photo you want. Camera Pro: Live Histogram. Understanding a histogram can help you capture the shot you want. This iPhone app gives you a live histogram while you’re composing your photo! This can be a tremendous assist in obtaining good exposure of your photo. The Select Grid Type button lets you choose from three types of guide or choose no guide. It also lets you select Single mode (one photo each time you tap the Shutter button) or Continuous mode (the app takes three photos one after the other). AutoStitch. Ever been at a food truck event and suddenly you find a great view that you want to capture — but the scene won’t fit into one photograph! The AutoStitch iPhone app lets you take overlapping individual photos of the scene and present them to the app in any order; AutoStitch then puts the panorama together correctly. With this app, as long as you take overlapping photos, you can make the panorama at a later time.